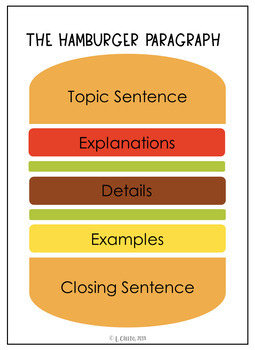 This Hamburger Paragraph Chart is labelled as follows: Topic Sentence, Explanation, Details, Example, Closing Sentence. I find this effective when preparing upper elementary kids to write essays that are more academic in nature! This is absolutely free, and editable, so go ahead, reclaim your social life!